Western blot analysis of whole cell lysates probed with PSMB4 antibody (VMA00142) followed by detection with HRP conjugated Goat anti Mouse IgG (1/10,000, STAR207P) and visualized on the ChemiDoc™ MP with 20 second exposure. Arrow points to PSMB4 (molecular weight 28 kDa). PSMB4 antibody recognizes proteasome subunit beta type-4, also known as 26 kDa prosomal protein, hsBPROS26, macropain beta chain, multicatalytic endopeptidase complex beta chain, or proteasome chain 3. Mouse anti Human PSMB4 antibody recognizes PSMB4, also known as 26 kDa prosomal protein, hsBPROS26, macropain beta chain, multicatalytic endopeptidase complex beta chain, proteasome beta chain, proteasome chain 3, proteasome subunit HsN3 and proteasome subunit beta type-4. The proteasome is a multicatalytic proteinase complex with a highly ordered ring-shaped 20S core structure. The core structure is composed of 4 rings of 28 non-identical subunits; 2 rings are composed of 7 alpha subunits and 2 rings are composed of 7 beta subunits. Proteasomes are distributed throughout eukaryotic cells at a high concentration and cleave peptides in an ATP/ubiquitin-dependent process in a non-lysosomal pathway. An essential function of a modified proteasome, the immunoproteasome, is the processing of class I MHC peptides. PSMB4 encodes a member of the proteasome B-type family, also known as the T1B family, that is a 20S core beta subunit (provided by RefSeq, Jul 2008). 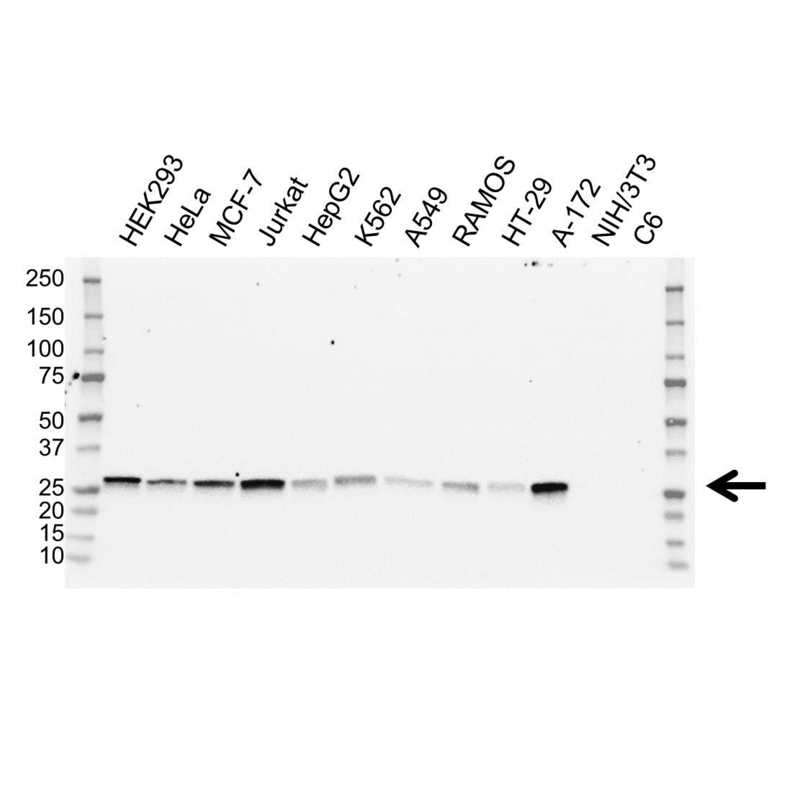 Mouse anti Human PSMB4 antibody detects a band of 28 kDa. The antibody has been extensively validated for western blotting using whole cell lysates. Anti PSMB4 detects a band of approximately 28 kDa in Jurkat cell lysates.